Go to college and get a high-paying job. That’s what most parents say they want for their children. But it’s hard to figure out which career path offers both high compensation and widespread demand. That’s why we created a new visualization breaking down the top 50 best jobs in America according to U.S. News & World Report. U.S. News developed its ranking of the best jobs by taking into account a variety of factors. They considered work-life balance, stress levels, and room for long-term career advancement. We took the top 50 and narrowed the focus to the two key things that really matter, compensation and projected job growth. We maintained the same order from 1 to 50, but our approach reveals that high job growth doesn’t necessarily equate to high salaries, especially when there are low barriers to entry. Here’s what we mean. 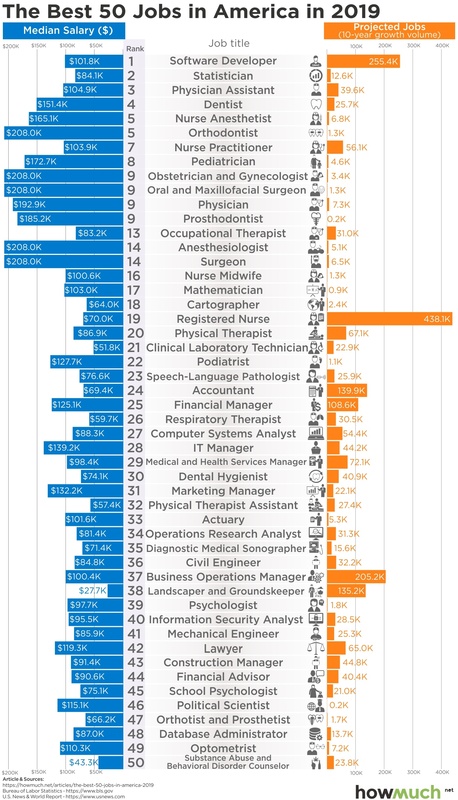 All of the occupations at the top of the ranking generate six-figure incomes with the exceptions of statisticians ($84.1k) and occupational therapists ($83.2k). There are several jobs in the medical field where applicants can expect to earn substantially more than $200,000, including orthodontists, obstetricians and surgeons. But look at the orange bars, which indicate how many new jobs researchers expect will be created in the coming years. We can rightly infer there is a relatively high bar of entry into these fields, namely, medical school. Not just anyone can become a doctor. Now compare these high-paying jobs with the middle and lower parts of the visual. There are a number of jobs with a reasonable degree of specialization, high pay and abundant job growth. Business operations managers, for example, can expect to make $100.4k while seeing well over 200,000 new similar positions in the next decade. And there are also very low-paid occupations with very little training required, like landscapers. If you’re thinking about making a career change, there are two occupations that stand out to us. The Internet Age requires software developers. They have the best job overall according to U.S. News, and it’s easy to see why with the combination of high pay and strong future job growth. Plus, the nature of writing software is engaging and intellectually difficult. And second, Baby Boomers are entering their golden years and require lots of additional nurses, a job which requires professional certification. And although lots of people will clearly become nurses in the coming years, there’s an obvious wage floor of about $70k that would provide almost anyone with a comfortable life.